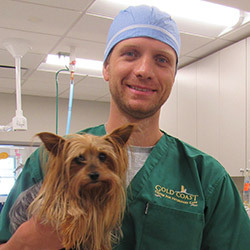 Dr. Matthew Raske has always loved animals, both domesticated and wild, and feels fortunate that he has been able to treat a wide variety of species and cases. Offering both non-surgical and surgical treatments, he enjoys all areas of orthopedic, soft tissue, and oncologic surgery. His special clinical interests include new technology, including minimally invasive procedures arthroscopy, thoracoscopy, and laparoscopy; advanced orthopedics and fracture management; and sports medicine. Dr. Raske is also interested in and certified to administer veterinary regenerative stem cell therapy. He has completed advanced training in tibial plateau leveling osteotomy TPLO and CORA-based leveling osteotomy CBLO for repair of cranial cruciate ligament injury, and he is certified in both total hip and total knee replacement. Dr. Raske volunteered his surgical skills with World Vets International Aid for Animals in Nicaragua and the Feral Cat Coalition in San Diego. During veterinary school he completed an externship and research at the Wildlife Conservation Society’s Bronx Zoo and Smithsonian’s National Zoo. An outdoor and sports enthusiast, he likes surfing, triathlons, traveling, scuba diving, fishing, rock climbing and supporting the New York sports teams. He was also a collegiate Division I swimmer. He has a house full of pets: Brooklyn, a Belgian malinois; Luna, a Dutch shepherd; Sassy, a cat; and OB, an Amazon parrot.